So glad to have you today Andrea. We are excited about your debut novel THE GARNET DAGGER, so let’s start right in. Tell our followers about it. Shonna, thank you so much for having me here today. 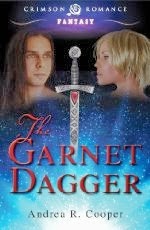 The Garnet Dagger is a fantasy / paranormal with a light romance thread. It’s about an Elvin who is bitten by a vampire. Since he is not human, this dark gift morphs into him having to feed on the life essence of others rather than blood. There is hope of a cure, though. Prophecy says he must find a witch; draw her blood, and pierce her heart. However, what will happen when he falls in love with her? Will he risk not only his cure but his people for love? Do you have plans to continue on with this story with another installment? Yes. The Garnet Dagger is a trilogy. I have books two Son of Dragons, and three War of Darkness already written. However, I’m working on revisions now. What was your inspiration for this book? My inspiration for this book came when I watched the first Underworld movie in the theaters. When I saw how they mixed the werewolves and vampires, it sparked an idea. Everyone knows what happens when a vampire bites a human—or in the case of the movie (spoiler alert) a werewolf, but what if the victim was Elvin? I’ve always enjoyed stories with magic, witches, paranormal, fae, mythical creatures, etc. even though they were not allowed growing up in my parents’ house. I couldn’t even watch Disney movies. So naturally, I craved fantasy and paranormal stories, and still do. I have yet to read George R.R. Martin, but am addicted to the HBO Game of Thrones show, and I read Tolkien for the first time two years ago after writing all three Garnet Dagger novels. So I’m shocked when reviewers compare me to these amazing writers. Why did I wait so long to read either of them? I was devouring the newer writers of fantasy and paranormal like Terry Goodkind, Robert Jordan, Kim Harrison, Yasmine Galenorn, Anne Bishop, PC Cast and others. Now, unfortunately I have little time for reading books that I want. I’ve always wanted to be a storyteller. Even in Elementary school, kids came up to me asking what we were going to play that day. I set the plot and the characters. Once, I even had us play space vampires with the kids using their fingers as fangs so we didn’t bite each other. I wrote poetry in my teens until my early twenties. But it wasn’t until my thirties that I started to write down the stories that had filled my imagination for years. What is a typical writing day for you Andrea? Juggling. I have three kids and two are under the age of five. I’m a stay-at-home mom so I write during nap time (if I’m lucky and they take a nap) and at night after they’ve gone to bed. I’ve written eight novels and have five more in various stages of completion. Many of these I started years ago, when I was working full-time. It was easier to write then because I had coffee and lunch breaks that I could use to write. Do you have conversations with your characters? Yes, all the time. I even have dreams about them. Brock, the hero in The Garnet Dagger, kept saying the first lines in the novel repeatedly in my head until I gave up trying to ignore him and wrote them down. What was the most unusual situation or place that you have been in when, "DING", you had an idea that just couldn’t wait and you had to get to your keyboard right away to get it all down? Once while my best friend was driving, I scared her. An idea popped into my head, I said "Oh" loudly, and she thought it was something in the road. Can you tell us about what you are working on now, or plan to start in the near future? I am working on edits to the second book in The Garnet Dagger trilogy, Son of Dragons. As well, I’m writing a YA shifter novel.What do you like to do in your spare time? Read, dance-I love Zumba, bounce book ideas off my friends. If I were trapped in a bookstore with a never-ending supply of food and water, I’d be in heaven. Tell us something about yourself that we cannot find on your website. I adore and am addicted to video games. If I had loads of free time (which is an oxymoron for a stay-at-home mom or even just a mom) I’d like to finish my Diablo III game. I’m all about the dungeon crawler, hack-n-slash games. Thanks for being here with us, is there anything you would like to say to our followers before we close? I am honored that so many readers have loved my stories. Thank you. 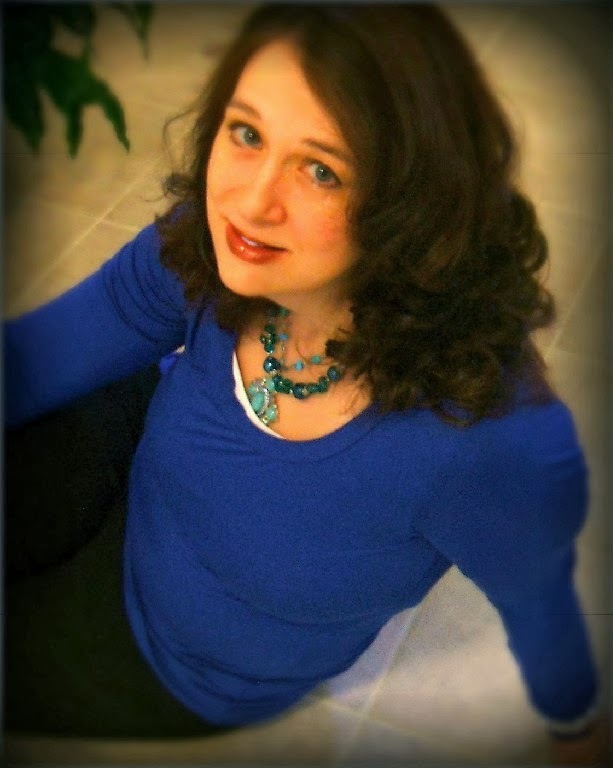 Andrea’s Bio: Growing up in Houston, Texas, Andrea has always created characters and stories. But it wasn't until she was in her late twenties that she started writing novels. The Garnet Dagger Blurb: Everyone knows what happens when a vampire bites a human…but what if the victim is Elvin? I’ve known death. For over half a millennia, I escorted many to death at the end of my sword. In the eyes of the dying, I watched it shroud them. Foolishly, I thought many more eras would pass before death came for me. It came so swiftly that I could not run; I could not escape. At a village, dressed in human clothes, I took in everything. By observing for eons, I understood and spoke their language. The world of mankind fascinated me. Their hobbled homes burrowed into the ground. Rocks crunched on top one another with thatched roofs woven from straw. Never had I seen a home or inn that was higher than three levels, as if they were afraid of the sky. I delayed my return to my people as I watched human jugglers bounce torches and knifes. It was autumn equinox and the festivities would continue well into the night. Children laughed as they chased each other. A trail of leaves from their costumes twirled after them. It was dark when I reached the forest. Since I was already late, I hiked uphill to a shortcut rather than take the long path back home. I didn’t need to alert any of my kind near the barrier at this hour. Liana would wonder why I was late. Tonight was the two month anniversary of our hand twining ceremony. One more month as was custom, and then we’d be wed. A gasp rustled through the trees. The roots shot a warning through to me with stifled caution. Adjusting my pack, I continued on instead of changing back into my Elvin clothes. After I passed the border which kept humans from entering our land, then I’d change. In the distance, I heard a groan. Curious, I spun in the direction of the sound. The autumn wind breezed through my worn human clothes, chilling me. But someone needed help. I turned in the direction of the sounds. Whatever made the noise should be a few yards ahead. I hiked slower than my normal speed, so as not to startle whatever human called out. My leather boots crunched upon dried, diseased leaves and bark. Horrified, I glanced up. Branches twisted around each other to suffocating. Lifeless limbs cracked in the wind. Flesh of the trees sloughed off in layers, exposing its bones. Gashes hollowed out chunks of warmth. Fragments of leaves clung to finger tips, marking sepulchers of the dying trees. Trees mourned with wails like splitting wood, and I brought my hands over my ears. I must flee before I became infected, they told me. Flee before the stain of this defilement creeps into you, they warned. Trees spoke to my kind, always had. Yet these trees were in such agony of death that I could not breathe. Felt as though my lungs had folded in on themselves, like a moth unable to break loose from its cocoon. Nothing I could do for them, and if I lingered too long, whatever disease gnawed upon them may choke me. Where would I go if I carried something so foul as to devour trees from the inside out? I’d never return to Tamlon if I brought this infection with me. I drew away, but a movement at the base of a decaying tree to my right caught me. My night vision picked up the sight of a human. His sallow face seemed to glow in the moonlight. Poking out from rags lay his arms and legs, which resembled skin stretched over sticks. So cadaverous was his face, I’d have thought him dead if he hadn’t moved. His gnarled fingers snapped on my arm, making me wince. Jerking me forward, his face contorted. Surprised by his strength, I fell beside him. Blackness curled around me. Teeth, fangs, broke through the skin on my neck. Then I knew him for what he was, a vampyre. Great interview! Sounds like an interesting read! Now THIS sounds like something I could get into!! Yay! Thank you. Glad you could stop by. I love those questions and answers! Great interview, Andrea. lol - hack'n slash gamer - great excerpt. oh, and get better soon. Loved the interview. I'm sorry you got sick. I can't believe you had more time to write with a full time job. I can't seem to get that working for me! All the best! !